Paneer Tikka is a Popular Indian Recipe, made from Paneer Cubes & veggies, marinated with Spices & grilled in a Tandoor.you can Grill in oven or fry at tawa. if you don't have oven, don't worry, i will teach you the simple method to grill the Paneer on tawa. It is usually served as a starter. you can make lots of variants to this Paneer tikka. When it is served as Gravy, it is called Paneer Tikka Masala. when it is wrapped inside Rolls, it is called Paneer Tikka Kathi Rolls.when it is Spread inside dosa, called Paneer Tikka dosa. Many fast food chains in India have added Paneer Tikka in their Recipes as toppings over Pizza or stuffing inside Sandwitches. Kitchen King Masala/Garam Masala - 1/2 tsp. Dry Mango Powder - 1/2 tsp. Kasthuri Methi - 1 tsp. Deseed the tomato & Capsicum , cut into square shape.Similarly cut the onions into square shape. Note: if you don't have hung curd,then hang 1 + 1/2 cups of curd in a muslin cloth for 1 hour to get half cup of hung curd. In a Mixing Bowl add Hung curd,Ginger Garlic Paste,Ajwain,Red chilli Powder,Garam Masala,Turmeric Powder,Dry Mango Powder,Coriander Powder,Kasthuri Methi,lemon juice,oil & salt.Mix well with curd. Then add Veggies & Paneer in it & Mix Gently. Refigerate it for 1 hour. Now, heat the tawa, add 4 tsp of oil, when oil is hot, arrange the veggies cook till it is chared, as shown in the Picture. veggies should maintain its crispness. cook in Medium low flame. Now remove the Veggies, In same tawa, arrange Paneer, add tsp of oil over it, cook & fry on both sides, till marination dries up & it turns Golden. Else if you cook for more time Paneer turns rubbery. Always cook paneer in Medium low flame. 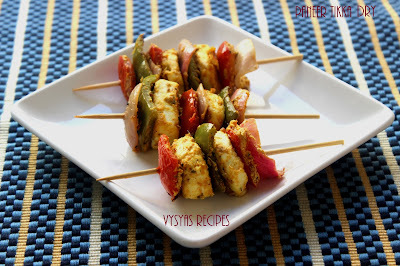 While still hot, Skewer the toasted veggies & Paneer alternatively on a skewer or toothpick. Now Paneer tikka is ready to serve. In Alternative Method, first arrange alternatively the marinated Veggies & Paneer in a skewer & heat it in tawa,drizzle a tbsp of oil over it, turn the skewers now & then, till the Veggies & paneer turns Golden at the edges. Always cook in medium low flame. Serve it with mint or coriander chutney along with lemon wedges or with Pyaaz lacchaa(onion lemon salad). you can also use different coloured capsicum. Instead of hung curd you can use sour cream also. Always fry veggies seperately & paneer seperately for even cooking. Instead of skewering, you can sprinkle chaat Masala or lemon juice on the Paneer Tikka for different taste.